ACC’s Student Emergency Fund is designed to keep you going to class when a financial emergency arises. Let’s say your car breaks down. Your car is your only transportation to school and work. The cost of the repair exceeds what you have in your savings account. What are your options? 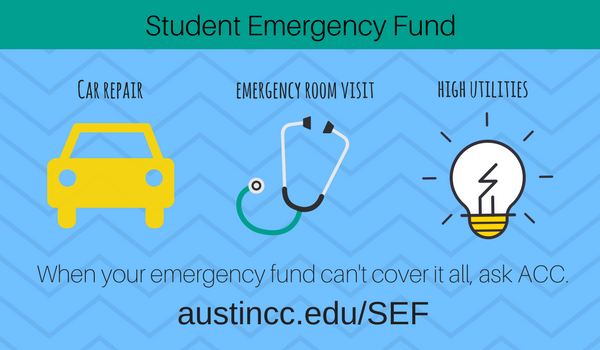 Consider submitting an application for emergency funds to help you meet your repair expense and ensure you get to class on time! Visit austincc.edu/SEF to submit your application.